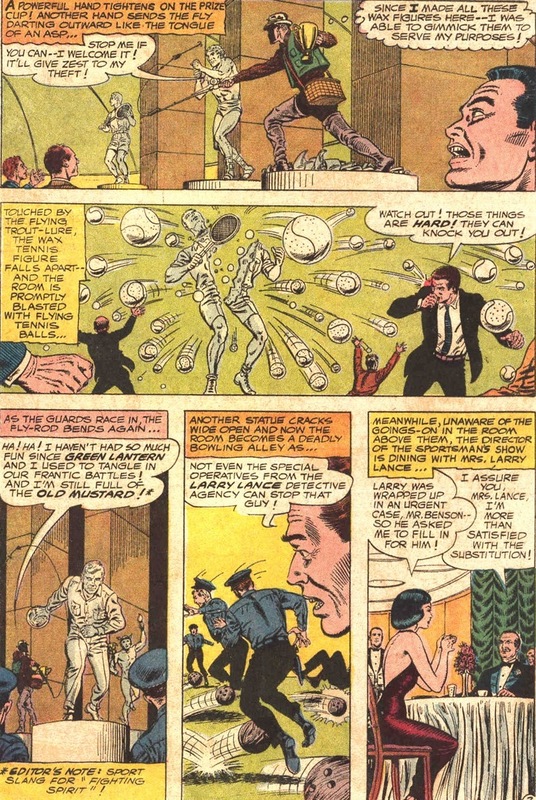 While I read old comics that Sportsmaster (real name Lawrence “Crusher” Crock) appeared in, I came across one that deserved its own article. 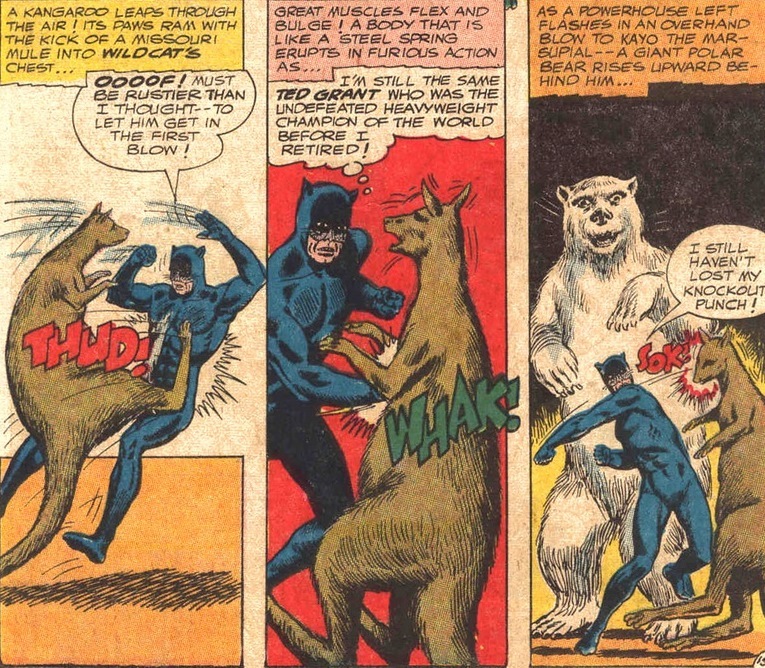 A comic from 1965 that’s silly, goofy, and loaded with horrific never-ending sports puns. 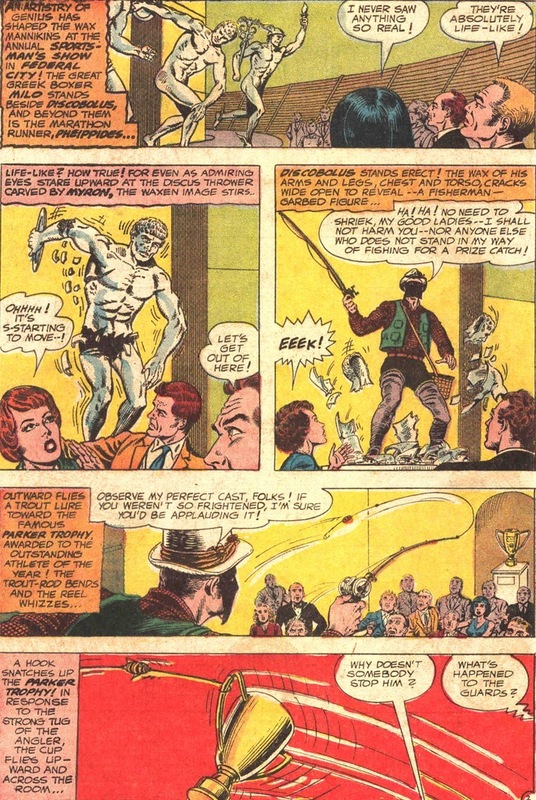 Today, enjoy select scenes from The Brave and the Bold #62, written by Gardner Fox and drawn by Murphy Anderson — an issue that wanted to be serious, action-packed, and loaded with horrific never-ending sports puns. If we can forgive superheroes for wearing underwear on the outside of their clothes, let’s also give puns a pass. I know that if I wrote an article cataloging every time Batman and Catwoman made out instead of covering a fifty year-old comic starring a supervillain with only twenty appearances under his belt, I’d receive thirty times the hits this one’ll get. I regret nothing. I have a soft spot for the weirdos. Sportsmaster flying on a single ski as he chucks the other one at Starman? 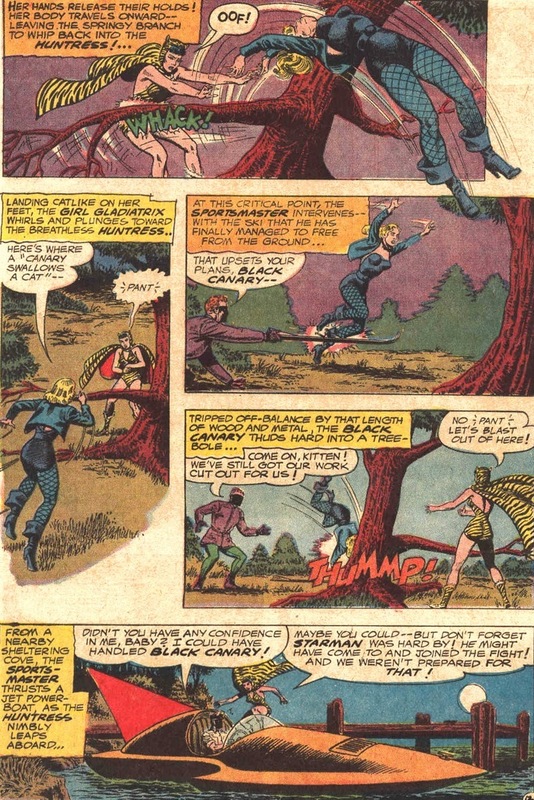 Promiscuous Lady Tarzan swing-kicking into Black Canary? A special super-star comeback for Wildcat? How can anyone be more excited? Starman (real name Ted Knight) premiered in 1941, two years after Batman and nine months before Wonder Woman. 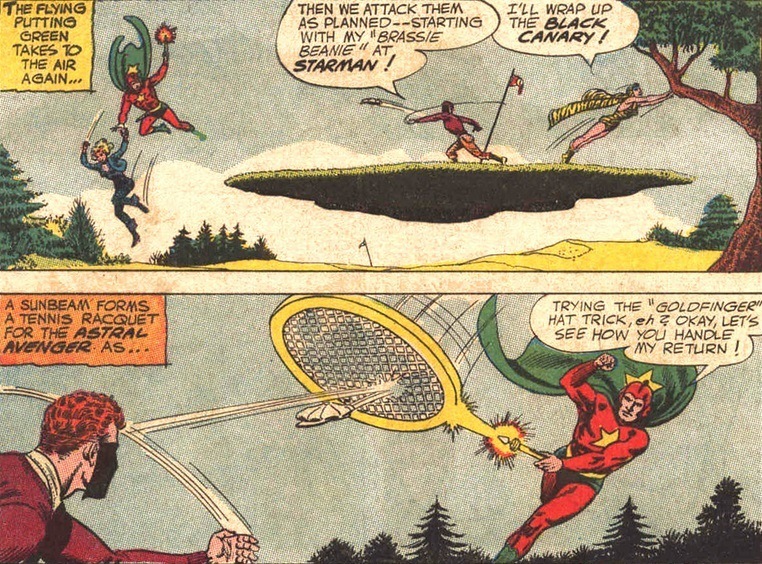 Using his cosmic rod, Starman operates exactly like Green Lantern except without that pesky wood weakness. To fully understand the criminal undertones Sportsmaster possesses, feast your eyes on his opening heist. While he may not turn thievery into an art form, he can at least do the opposite. 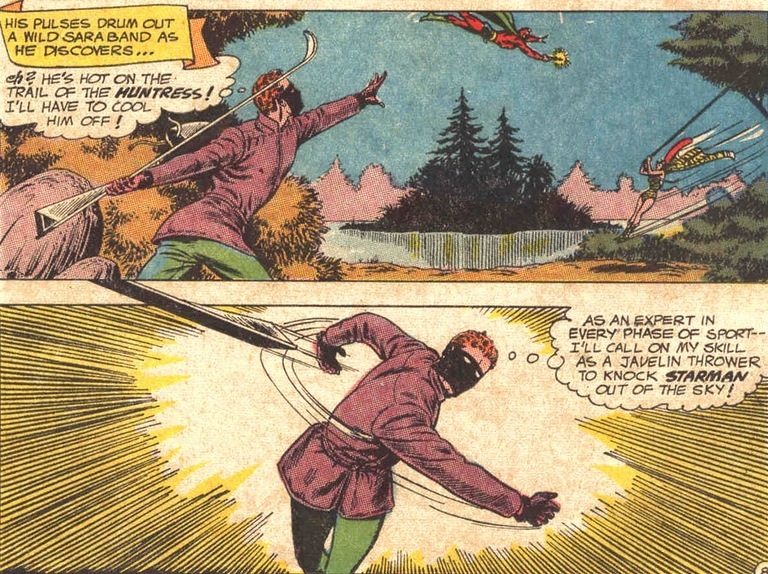 1) Sportsmaster dresses like a fisherman when using his fishing rod. 2) He wears his actual supervillain costume underneath the plaid and vest. 3) He does the above after hiding for hours inside a statue. 4) He escapes on rocket skis. 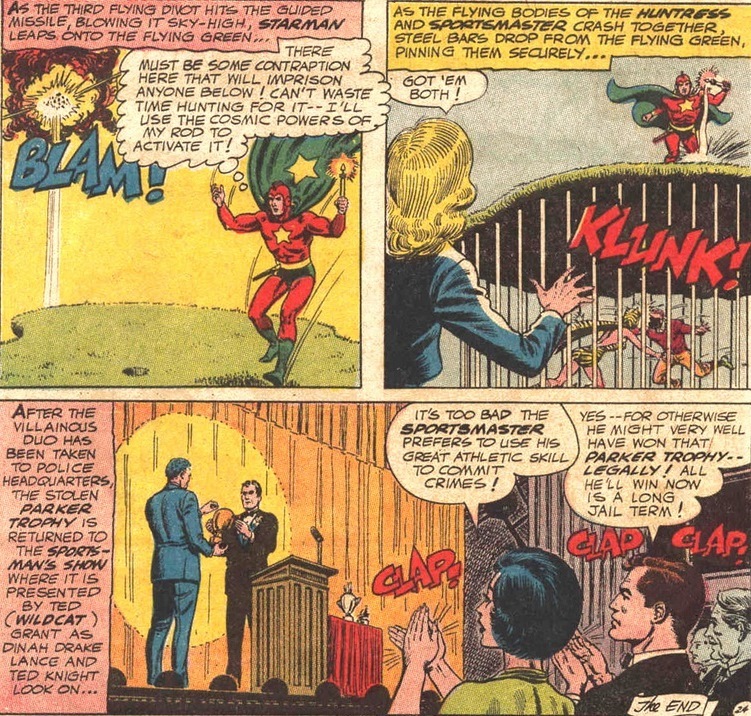 5) After all that, Sportsmaster only planned to steal a trophy. 6) Old mustard is not sport slang for “fighting spirit.” I checked. 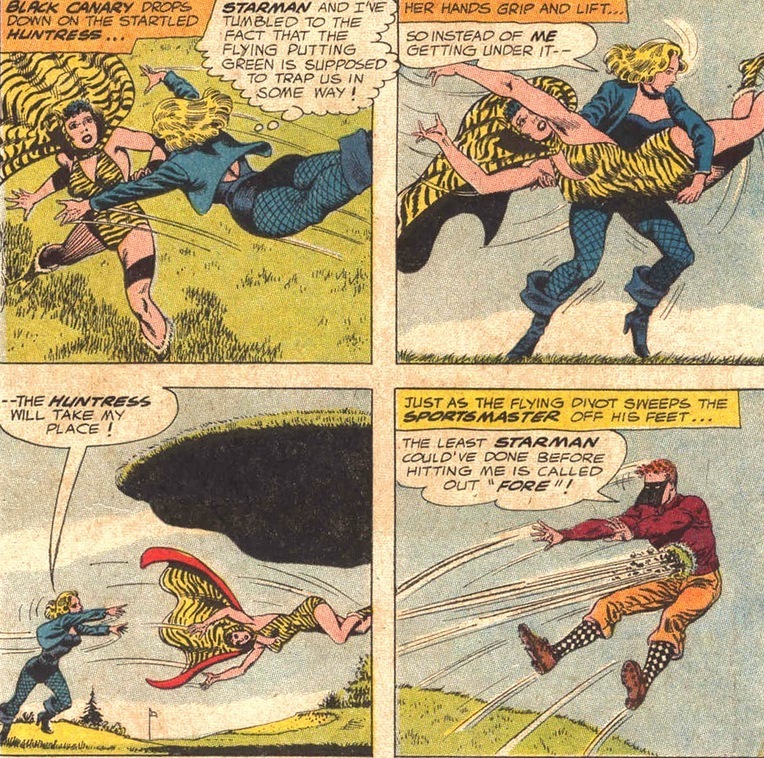 Sportsmaster’ll totally protect and his partner-in-crime-and-marriage Huntress. No morals doesn’t mean no heart. Commence round one. Game on. En guarde. Touchdown. 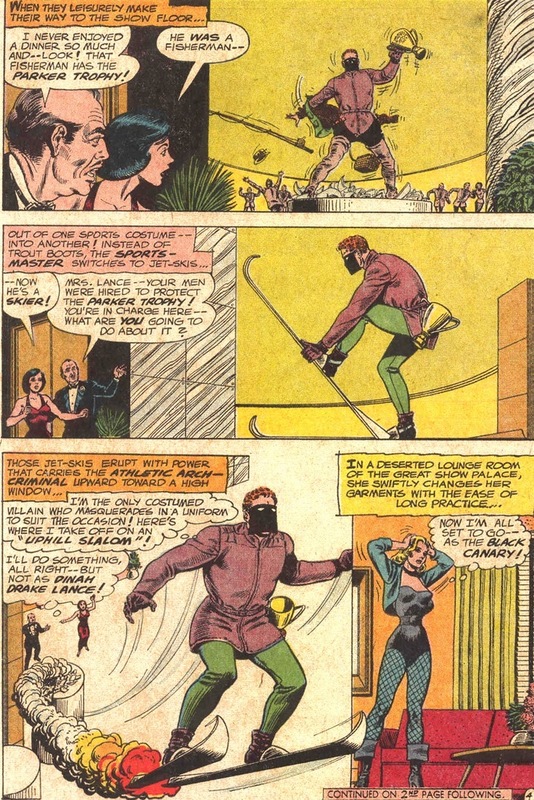 You’re about to witness one of Black Canary’s most humiliating moments. That includes dating Green Arrow for decades. 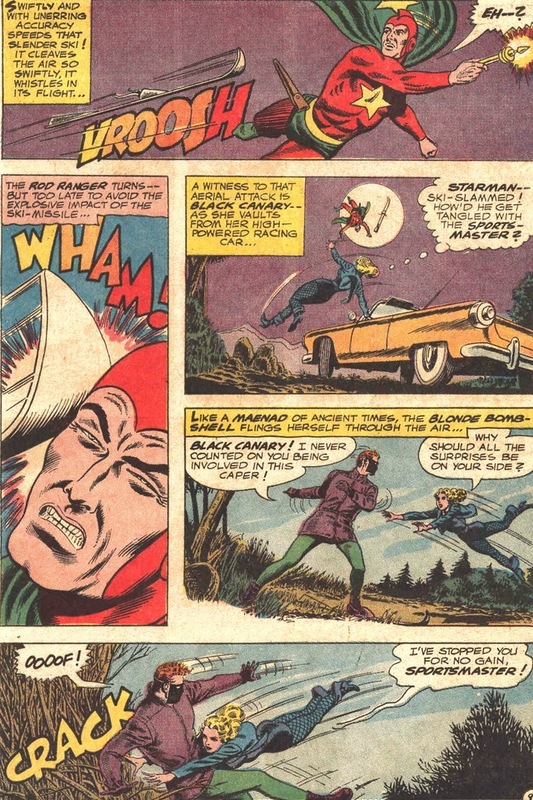 That’s no way for a superhero to bonk their head on a tree. Her feet flail high in the air as she slams her skull much in the style of an unconscious skydiver. The two supervillain masterminds escape to rob another day. Will their next plot be as dastardly as the first one? Will truth, justice, and the American way prevail against such evil? Will Sportsmaster wear an appropriately themed outfit? 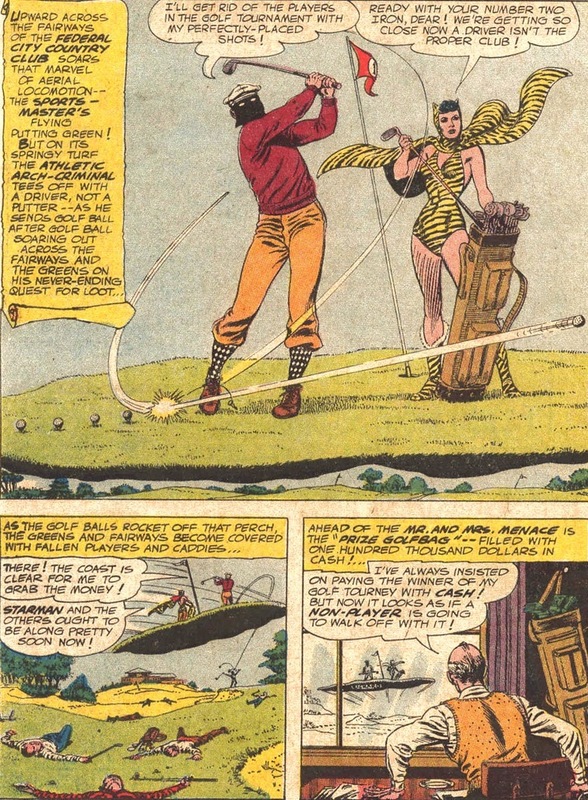 If you don’t fully follow the newest scheme, Sportsmaster and Huntress plan to steal $100,000 by knocking out every single golfer in the tournament with a ball to the noggin. While riding a magic putting green. Sometimes I think I missed out on something enchanting back in the ’60s. Especially the potential of sky battle golf. 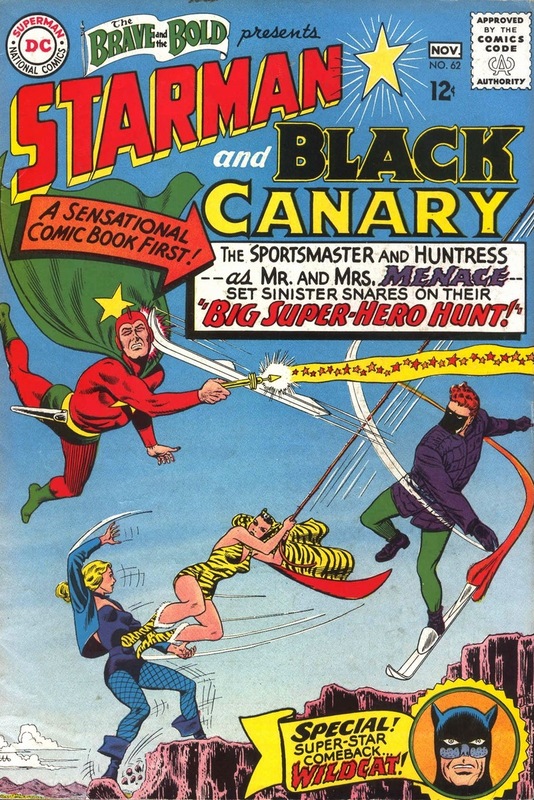 I love reading decades old DC stuff, if just because it’s fascinating to see just how much the writing and storytelling has changed in the modern day. I mean, really when you think about it, even the name Batman would never be chosen in today’s comics. It’s good to read the character roots, no matter how silly they sometimes seem — or maybe they just seem silly because I’m an adult man.